Meet the latest addition to our Poesie collection, the shields series! A symbol bearing protection and strength, this round signet shield is simple enough to wear everyday, but classic enough to become an enduring part of your style. 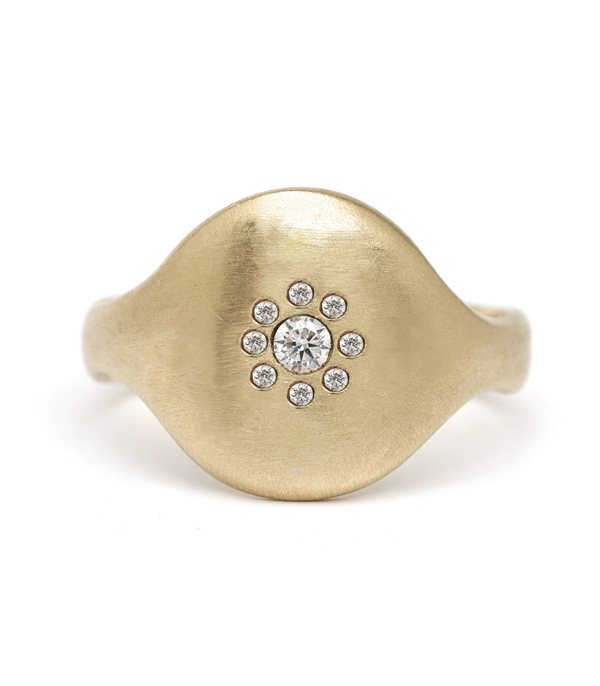 Cast in sold 14K gold, this statement ring is set with a petite diamond cluster (0.04 ctw) which contrasts elegantly against a smooth matte golden background, a beautiful juxtaposition of masculine and feminine elements. This ring is also available without stones, engraved or set with a variety of options. The possibilities are endlessly dreamy. Please contact a stylist to discuss your favorite option.